I’m a born-and-raised Sunshine state girl, and St. Augustine is one of my favorite places to visit in Florida. 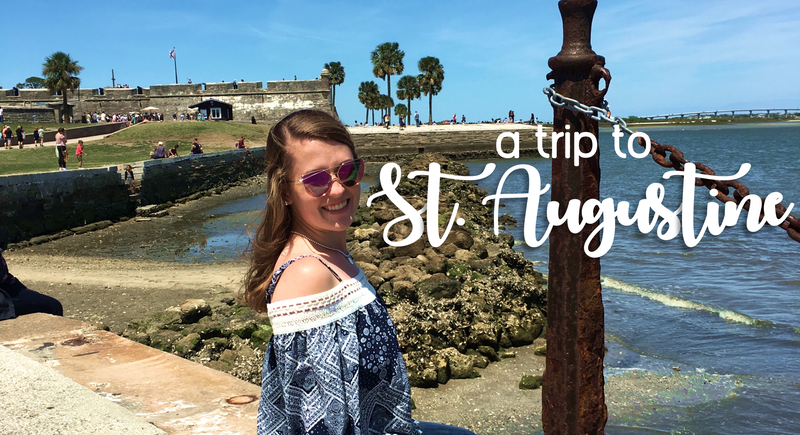 I took a day trip to St. Augustine this past Sunday with my sorority, and had so much fun exploring the fort, waterfront, and cute shops along St. George Street, so I wanted to make a travel guide for some great places to visit if you’re ever in the area! There are lots of tours/things you can pay to experience, but my friends and I only paid for food and yummy snacks on this trip, and spent our time exploring for free! Here’s some of my recommendations for food and fun in the historical city. When we arrived to St. Augustine after the long bus ride from Tallahassee, we were eager to eat. St. Augustine has so many great restaurants for meals, coffee, ice cream, or whatever you’re craving! The ultimate stop for all coffee-lovers. I’m not a big coffee-drinker so I didn’t stop here, but all my coffee-drinking-ladies were raving about this place! Located right on the end of St. George Street, close to the fort, this is a great stop for pizza and Italian food. Anyone can find something to enjoy here! This is where my friends and I ate lunch. It’s located towards the middle of the street of shops, and it was perfect weather for sitting on the outdoor patio and people watching while we ate. We mostly had burgers which were pretty average, but my friends said their other entrees were awesome! The atmosphere and service was great, and for $10-12 a meal, it’s a worth checking out! If you love empanadas or sweet treats, this is the place for you! The cute little bakery is set back in a courtyard towards the middle of St. George street, and everything in there looked and smelled amazing. A dessert classic. There isn’t just one, but two Kilwin’s on St. George Street, so you can’t miss them! We stopped for some fudge to share, and all the other treats were difficult to resist. It was love at first sight for me. This little ice cream/fudge/fresh lemonade shop is a must. It’s sister restaurant is Burger Buckets, located right across from Al’s Pizza, and is also a great stop! I enjoyed some delicious ice cream from Fudge Buckets, and my friends loved their freshly squeezed lemonade. If you’re a high school or college girl in Florida, there’s a pretty good chance you’ve seen someone post a cute popsicle picture from here. The Hyppo serves all natural popsicles with creative flavors like Straight-Up Strawberry, Pineapple-Cilantro, and Mexican Hot Chocolate. I loved my watermelon popsicle from here, and so many of my friends stopped here throughout the day and only had good things to say about it! Like I mentioned, I didn’t spend a dime during this trip for any tours, but there’s plenty to do just walking around and exploring! This fort is a huge part of St. Augustine and you literally can’t miss it, it’s huge! You can pay to tour the inside and see them shoot off the canons, or you can just walk around the outside and stop for some photo-ops right along the water. I didn’t stop here this trip, but it’s a short walk from St. George Street and is beautiful to tour! I recommend going here at least once in your life! I toured the museum with my mom when I visited St. Augustine on a 4th grade field trip, but you’re really never too old for Ripley’s! This little beloved landmark can’t be missed during your stroll down St. George, and makes a cute stop and picture spot! There’s so many cute boutiques and shops along the street, and lots of trinkets and goodies to find! These are just a few of the amazing places to visit in St. Augustine, and it was fun to just walk around and see what we could find. There’s something for everyone to enjoy and there’s no way you can have a bad time walking through such a beautiful, historic city! I hope you enjoyed my recommendations, and I’d love to hear some of your favorites if you’ve ever been to St. Augustine! Your ice lolly looked really nice! Sounds like a fun trip! Ahhh that would be great!! I definitely want to visit again, I have some friends in the area and everything in the area is so cute!